Radioactivity levels at Bikini and Enewetak Atolls were extensively studied in the decades after the testing ended, but there has been relatively little work conducted there recently. A team of scientists from Woods Hole Oceanographic Institution (WHOI) reported that levels of radioactive cesium and plutonium have decreased since the 1970s, but these elements continue to be released into the Pacific Ocean from seafloor sediments and lagoon waters. The levels of plutonium are 100 or more times higher in lagoon waters compared to the surrounding Pacific Ocean and about two times higher for a radioactive form of cesium. Despite these enrichments, they do not exceed U.S. and international water quality standards set to protect human health, the scientists reported Oct. 30, 2017, in the journal Science of the Total Environment. To determine the source of these radionuclides in lagoon waters, the WHOI scientists measured the amounts and flow of radioactive material entering the ocean from groundwater seeping from the islands. They found that groundwater was a relatively low source of radioactivity. In particular, they found that radioactive groundwater was not leaking much from beneath one suspected potential source: the Runit Dome on the island of Runit—a massive 350-foot-wide concrete lid that covers 111,000 cubic yards of radioactive soil and debris that were bulldozed into a bomb crater and sealed over. It was constructed in the late 1970s by the U.S. government to contain contaminated waste from the nuclear tests. The bottom of the Runit Dome is not lined and below sea level, so scientists and others have been concerned that tidal action could move water through the buried radioactive material and bring it out to sea. 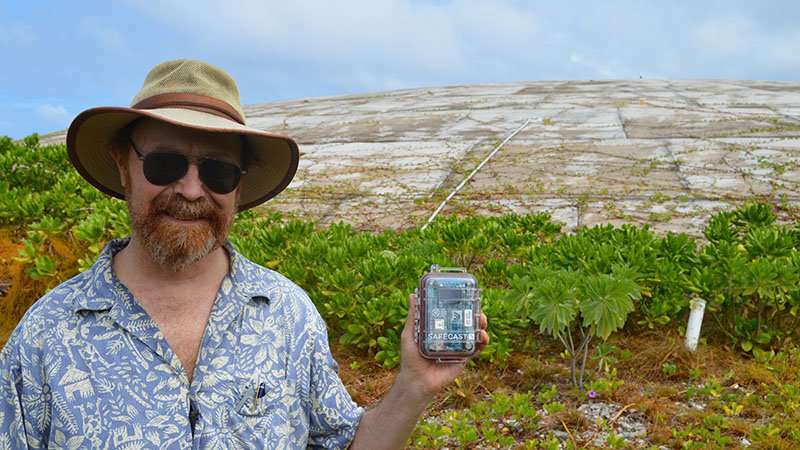 "The foundations of these island atolls are ancient coral reefs that have the porosity of Swiss cheese, so groundwater and any mobilized radioactive elements can percolate through them quite easily," said WHOI geochemist Matt Charette. Though that does not seem to be happening now, the scientists advise that the Runit Dome area should be continuously monitored as sea level rises and the dome deteriorates. Using isotopes of plutonium that act like a fingerprint to pinpoint sources, the WHOI scientists found that the seafloor sediments around Runit Island seem to be contributing about half of the plutonium to the lagoon. "Additional studies examining how radioactive plutonium moves through the environment would help elucidate why this small area is such a large source of radioactivity," Buesseler said. The WHOI scientists who conducted the study and wrote the report included Ken Buesseler, Matthew Charette, Steven Pike, Paul Henderson, and Lauren Kipp. They sailed to the islands aboard the research vessel Alucia on an expedition funded by the Dalio Explore Fund. The team collected sediments from the lagoon with poster tube-sized collectors that were inserted by divers into the seafloor's sediments, filled with mud, capped. Back in WHOI laboratories, the cores were sliced into layers and analyzed to reveal a buried record of local fallout from the nuclear tests. The scientists also collected and analyzed samples of lagoon waters . On the islands, they collected groundwater samples from cisterns, wells, beaches, and other sites. They analyzed these samples for the levels of radioactive cesium and plutonium from weapons tests. 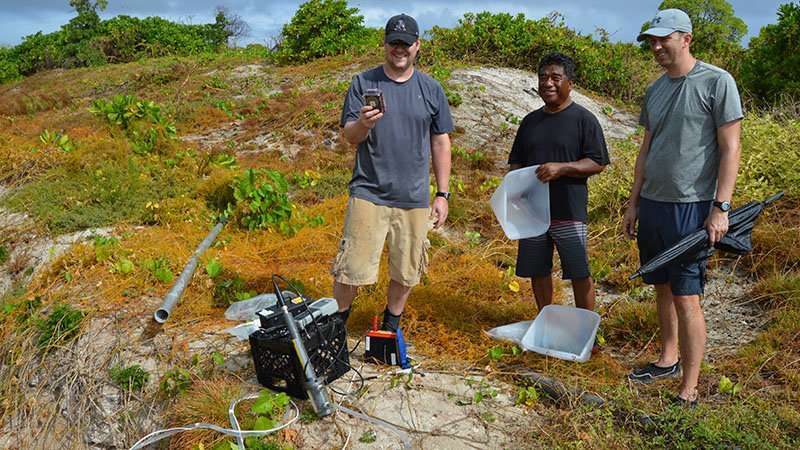 For the first time on these islands, the scientists also measured isotopes of radium, a naturally occurring radioactive "tracer" that give scientists key information to determine how much and how fast groundwater flows from land into the ocean. The WHOI research team also compared the radioactive contamination at the Marshall Islands to the contamination found today near Fukushima in Japan in the aftermath of the Dai-ichi Nuclear Power Plant disaster. "In contrast to Fukushima, where cesium is the most abundant radionuclide of concern, in these atolls, the focus should be on plutonium, given its significantly high levels," said WHOI radiochemist Ken Buesseler. The U.S. conducted 66 nuclear weapons tests between 1946 and 1958 at Bikini and Enewetak Atolls, each a ring of low-lying reef islands that surrounds a larger lagoon. Bikini has 26 islands; Enewetak had 42 islands, but three were bombed out of existence. They became known as the western part of the "U.S. Pacific Proving Grounds." 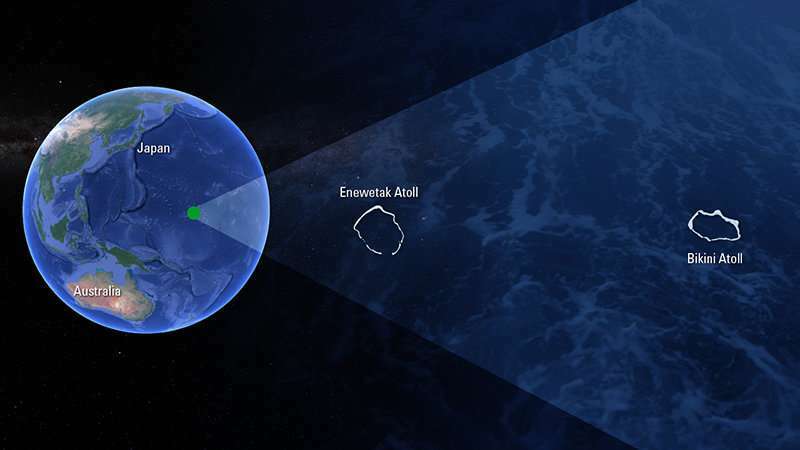 Bikini and Enewetak are among 29 atolls that make up the Republic of the Marshall Islands, located in the equatorial Pacific, about 2,500 miles west of Hawaii. The collective land area of the thousands of small islands is equivalent to the area of Washington, D.C. but they are spread across an ocean area that exceeds the size of Alaska. The work holds particular significance to the atolls' indigenous populations which were evacuated before the tests and thus far have only been allowed to return to one small island in the Enewtak Atoll.